Walker & Dunlop, Inc. announced today that it structured $65,200,000 in financing for The Hermitage Apartment Homes. 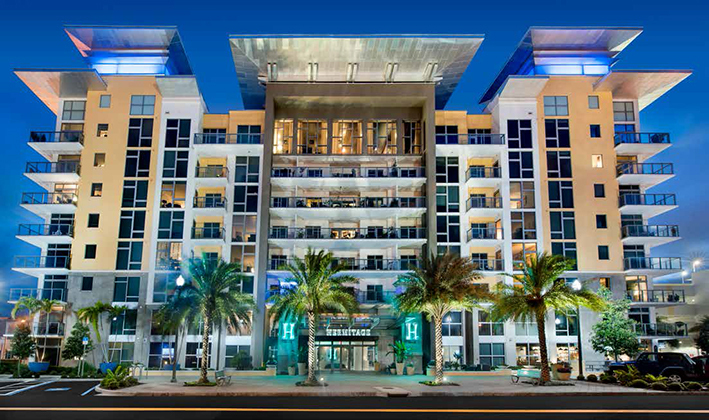 The property is a newly-developed, 348-unit, Class A apartment community in the heart of downtown St. Petersburg, Florida, one of Tampa Bay's premier submarkets. Home to Florida’s Innovation District, the city contains a cluster of higher education, marine science, healthcare, business incubation, and media institutions, including Johns Hopkins All Children’s Hospital, Bayfront Health, and the University of South Florida St. Petersburg. Alison Williams and Matt Baldwin, both Tampa-based members of Walker & Dunlop’s Capital Markets team, completed the debt transaction on behalf of the client, Brass Enterprises. Drawing on their extensive experience in financing multifamily properties, the team identified Freddie Mac as the ideal lender for the acquisition and structured the seven-year loan with an attractive interest rate and full-term interest-only payments. “We have had the privilege of working with Brass Enterprises for the past seven years and this acquisition fits perfectly into its portfolio of luxury apartments in thriving submarkets. The project’s construction, luxury amenities, and exceptional walkability make it the preeminent community for residents of all ages,” said Ms. Williams. Walker & Dunlop is a leader in the commercial real estate finance space and has grown its Capital Markets group rapidly over the past several years. The company completed $8.6 billion in brokered loan originations in 2018, a 17 percent increase from 2017. To learn more about Walker & Dunlop’s diverse array of financing options, visit our website.